A couple have been banned from keeping animals for five years after "one of the worst cases of cat neglect" seen by a Scottish SPCA inspector. Carol and Samuel Baird, of Banff, admitted causing their cat Austin unnecessary suffering. It was found struggling to walk due to its badly matted hair. It was suffering from weight loss and muscle wastage. Banff Sheriff Court heard the cat later had to be put down. The couple were fined a total of £1,200. Insp Alison Simpson, of the Scottish SPCA, said, "This was one of the worst cases of cat neglect I've dealt with and I've worked with the Scottish SPCA for more than 20 years. 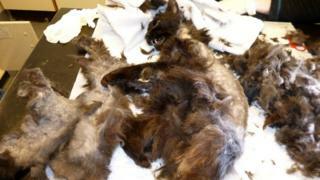 "Austin was so badly matted that the vet needed to sedate him to be able to remove the matted fur. "Due to Austin's advanced age and extremely ill health, a good quality of life could not have been achieved. "Following extensive examination, a vet decided that the kindest thing to do was put Austin to sleep and end his ongoing suffering. "I hope the pair seriously consider their ability to look after animals once the five-year ban has passed."